Facebook, LinkedIn, Twitter, Instagram, and other social media have radically changed the ways in which organizations, groups, and individuals spread, share, and discuss ideas and information. They provide platforms for expressing opinions very rapidly to a wide audience, without interference from an editor or a group of editors. With traditional platforms like newspapers, radio, and television, the steps from formulating a viewpoint to reaching an audience with it tend to be complex and slow. The sender will usually have to convince someone with editorial powers that the message is worth publishing. This is not so with social media, where each person can be his or her own editor and immediately release personal content to an audience. From an organizational perspective, the dramatic changes in publicity options create a range of ethical challenges. This chapter provides a preliminary categorization of ethical dilemmas for users of social media based on input from professionals who are engaged in digitalization processes in their organizations. Social media introduce a range of new ways for individuals, groups, and organizations to spread, share, and comment on ideas, beliefs, and information. They no longer need to go through an editor to get their views published. This chapter explores the ethical dilemmas that can occur with social media use in everyday organizational settings. There are other ethical aspects of social media that will not be addressed, most notably those connected to the use of Big Data in research, product development, and marketing. These have already been under scrutiny in other research (Bender, Cyr, Arbuckle, & Ferris, 2017; Kosinski, Matz, Gosling, Popov, & Stillwell, 2015). The focus here will be on the concrete dilemmas that arise in workplaces adapting to a reality where Facebook, Twitter, LinkedIn, Instagram, and other social media have created a radically different environment for conversation and interaction. 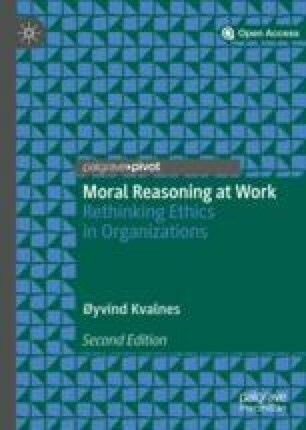 The dilemmas discussed in this chapter will be constructed from input delivered by executive students who have participated in my ethics training sessions in a program on digitalization and leadership. For a number of years, I have invited students to share dilemmas they have encountered when working professionally with digital transitions within organizations, including the development from using traditional to digital and social media. Based on the input from these sessions, I will outline a list of five categories of dilemmas that can occur when leaders and employees in an organization apply social media at work. The following story exemplifies what we may call a role dilemma. Financial advisor Peter works for a local bank in the district where he grew up. Three of his former colleagues in the bank have left to join a competitor in the same district. Those three are still in contact with a range of former colleagues, even though they are now employed by a competitor. On Facebook, current and former colleagues have established friendships across the competitive divide and frequently share and like each other’s content there. Facebook is an important platform for both banks and a place where they can interact with actual and potential customers and demonstrate their banking competence. They can also reach out to the public with information about new products and invite people to evening seminars, information meetings, and other arrangements. Recently, Peter has noticed that some of his own colleagues in the bank even share, like, and put favorable comments on professional content published by their former colleagues. He is very critical of this practice of assisting former colleagues in spreading professional content from their new employer, who is a serious competitor making the effort to tighten its grip on the banking market in the district. He believes the colleagues doing this are confused about their roles in social media. They behave like friends and should instead realize that they are first and foremost employees of competing organizations. When Peter brings up the topic with his colleagues, they argue that what they are doing is normal and right in a knowledge-sharing economy. Social media like Facebook, LinkedIn, and Twitter are designed to make information available to everybody. Knowledge hiding, where you try to gain advantages by guarding your own knowledge, is a thing of the past. Sharing is good for banking as an industry, they argue, as it means that the decision-makers have to be alert and ready to develop new services and products based on insights that are available to everybody. The kind of knowledge sharing Peter finds unacceptable actually triggers innovation and can be beneficial to all, they claim. It is an assumption based on their personal experiences, but it can also find some backing in research (Leonardi, 2017). Peter disagrees and argues that his colleagues’ sharing practices on Facebook provide the other bank with a competitive advantage that can lead to a decline in profits for their own employer and a gradual loss of the banking hegemony in the district. A role dilemma occurs when the roles of the people who are active in social media are unclear or open to different and conflicting interpretations. Are these words the expressions of a professional or a private person, a colleague or a friend, a company owner or a concerned citizen, an expert or a non-expert, or a teacher or a dismayed employee? Dilemmas arise when the sender has one understanding of his or her role, whereas various receivers interpret the role differently, leading them to have conflicting perceptions of what should be the next step forward for the sender or receiver. From the sender’s point of view, the dilemmas can occur in advance of a particular interaction. How will the message I am about to publish be interpreted? Am I entitled to express it? Based on one interpretation of what my role is, I should not post the message, but based on another, I am in my full right to do so. Will the receivers understand that I make this claim as a private citizen and not as an employee of this particular organization? Dilemmas can also occur in the aftermath of an interaction, when the sender realizes there can be more than one reasonable interpretation of the message, based on different understandings of his or her role. Then the choice can be made between remaining committed to the message and the way it was published and admitting that it was a mistake to put it forward. There can also be role dilemmas where decision-makers in an organization create role confusion. One of my students worked as a journalist in a magazine and explained that the owners wanted to professionalize the use of their Instagram account by hiring an advertising agency to run it. Social media specialists from that agency would post photos on the account, accompanied by text to the effect that “we” will be on this location today, and you can meet “us” there, creating the impression that they were journalists from the magazine, when in fact they were hired externals. The real journalists were critical of this approach, as they felt that it would trick the readers and users of Instagram into thinking that the people on location were actually part of the magazine’s own team. It has been interesting to apply the principle of publicity, articulated in Chap. 5, to this dilemma in different teaching contexts. The principle claims that we should be willing to defend our decision publicly and be open about it to relevant people and groups. I have presented the dilemma to young students (20 to 25 years old) and to executive students (30 to 50 years old). In the first group, the majority sees no problem with hiring people from an advertising agency to run the Instagram account on behalf of the magazine. This is already happening with hired help in a range of contexts, they argue, and it makes no difference to them as users whether the people they meet are permanently employed by the magazine. In the second group, most people experience that the idea goes against their basic moral intuitions and is an alternative that would not stand up to public scrutiny, as it erases the difference between employed, professional journalists and hired nonprofessionals, who admittedly have more competence in the use of social media. Here we see an interesting example of a generation gap when it comes to moral intuitions and ethical analysis, one that may be indicative of an emerging change in people’s perceptions of roles. The second category of dilemmas in social media arises in connection with the speed in which the interactions tend to take place. We can call them tempo dilemmas. Things happen very fast in social media, and part of the attraction is to participate in a pulsating activity where intuitions are at play. In terms of the distinction between the fast System 1 and the slow System 2 of decision-making (Kahneman, 2013), this is clearly an arena where the former dominates. If you slow down and try to activate System 2, you are likely to miss out, as the discussion has moved on and your carefully crafted expressions are no longer relevant. Input from my executive students indicates that traditional leaders find the high tempo to be particularly challenging, making them wary of entering the social media arena. They are understandably concerned that they might lose control on a communication platform characterized by rapid exchanges of words but are also afraid to miss out on business opportunities by staying away. Other people in the organization may be witnesses to this kind of behavior and can then face the dilemma of choosing whether to intervene and give critical input to the sender or remain silent. In some cases, this will be a real dilemma, in that on the one hand it is really important to stop the sender from putting himself or herself and the organization into further trouble, and on the other hand it may be a bad career move or the last thing the observer does in this organization. In other cases, it will be a false dilemma, as clearly the right thing to do is to intervene, and the personal cost of doing so is not all that high, but it is nevertheless tempting to turn a blind eye to the situation so as to avoid personal trouble. refrain from speaking up against content that you disagree with or find appalling. Both of these responses depend on putting your own moral convictions and beliefs aside in order to become and remain popular with actual or potential friends and followers. Organizations want to see the number of friends, followers, and likes in social media grow. To that end, they may expect their employees to keep personal convictions and values in check, even when these are well aligned with what the organization itself is supposed to stand for. As we saw in Chap. 6, being committed to a stable set of values can be instrumental to corporate flourishing (Collins & Porras, 1996). Sacrificing integrity for popularity in social media is risky business but can nevertheless be part of what corporations expect from those who run their social media outlets. What kinds of opinions are acceptable to express in social media? This is the question behind the fourth category of ethical dilemmas in this area. We face a speech dilemma when one set of considerations supports the publication of an expression and another set of considerations goes against it. With traditional publication channels, the task of balancing those sets up against one another and making a decision rests both with the sender and with the editors who have the final say about publication. With social media, the editors are gone, and the senders, both of personal messages and messages on behalf of organizations, need to account for ethical aspects, including those who are in favor and those who go against publication. Providers like Facebook and Twitter are also expected to moderate the flow of input on their platforms and to remove expressions of harassment, hate speech, trolling, and misinformation. The general ethical tension for them and the users is between promoting free speech on the one hand and being on guard against potentially harmful expressions on the other. To what extent should we accept aggressive behavior in social media and defend it in the name of freedom of expression or free speech? Political exchanges on Twitter can sometimes include rude and hateful expressions, and the platform struggles to point its users in healthier and more constructive directions. The importance of moderating the exchanges is underlined by research showing that trolling and harassing behaviors in social media are contagious. People who are normally well behaved will tend to become harassers if they are exposed to that kind of behavior (Cheng, Danescu-Niculescu-Mizil, Leskovec, & Bernstein, 2017). The dilemmas my executive students identify in this area are often connected to role dilemmas. What is the scope of action for a leader or employee when it comes to speaking his or her mind in social media? Once the particular role of the sender has been established, and there is clarity about who he or she is in this particular context, it remains to be considered whether there are limitations to his or her freedom of speech. How active should a CEO or other leaders in an organization be in discussions about contested political topics like immigration and religion? What are the limits to what a teacher can say in a public discussion about the current leadership of the school authorities and the direction they are taking the educational system? These are open questions whose answers depend on further details of the situations. What the questions exemplify is how ethical considerations about free speech become particularly pressing in the era of social media, where people can easily publish and spread their opinions and no longer depend on external editors to get their messages across. Speech dilemmas of a particular kind occur when an organization receives criticism from a customer, client, or other stakeholders and needs to find a reasonable way to respond. The criticism may be based on what the organization sees as a false representation of the facts of the matter, but presenting a truer picture may be problematic. One executive student described a situation where the bank he worked for had recently turned down an application for a loan to a local businessman, based on an analysis of the prospects of the project the loan was supposed to finance. The bank did not share the optimism expressed in the customer’s presentation of the business case. The businessman became furious when he received the rejection and wrote a post on Facebook where he attacked the bank and encouraged his friends and contacts to boycott it. The version he put forward about the project, glossed over major weaknesses the bank found to be wanting. Now the bank faced the challenge of finding a response that would protect its own interests, without revealing the confidential details the businessman had chosen to hide from the readers of his Facebook post. The final category in this preliminary list of ethical dilemmas generated by social media is that of competence dilemmas. Experienced users of social media build up competence in applying them and can meet customers, clients, and competitors who in contrast are novices. To what extent is it acceptable to exploit the competence gap to one’s own benefit? In many cases, this will be ethically unproblematic, such as when you have gained an upper hand in social media competence in comparison to a competitor and use that to your own benefit. The dilemmas can occur in a professional–client relationship, where the former can exploit a competence gap in relation to the latter by offering services at a higher price and at a more sophisticated level than the client needs. The professional may be an expert on social media use and sell services that the client lacks the competence to evaluate, and the imbalance introduces the possible misuse of client trust. Conflict of interest is at the core of ethics in professions (Nanda, 2002). Doctors, lawyers, auditors, and teachers all have specialized competence that makes them capable of delivering specialized services. There is typically a competence gap in place between them and the patients, clients, and students, making it difficult for the nonprofessional parts to evaluate the services at hand. Professionals more or less explicitly promise to give priority to the interests of those who require their services and to not give in to the temptation of putting their self-interest first. The situation is similar to competence dilemmas in social media. Even there we find conflict of interest. The social media novice can decide to trust the provider not to exploit the gap in competence in his or her favor. In line with the distinction between real and false dilemmas, introduced in Chap. 2, competence dilemmas as they are described here are actually false dilemmas, as the choice is between doing the right thing (looking after the client’s interest) and doing the wrong thing (prioritizing self-interest). Role dilemmas: Who are we in social media? Professional, employee, friend, owner, politician, private individual, or more than one of these at the same time? Tempo dilemmas: What kind of information and opinions do we spread with the touch of a finger? What do we miss out on if we slow down and are more thoughtful? Integrity dilemmas: To what extent do we downplay our own principles and values in order to gain new friends and followers, and more likes? Speech dilemmas: What kinds of opinions are acceptable to express in social media? Where do we draw the line for free speech in the processes of expressing disagreement and defending oneself against unreasonable criticism? Competence dilemmas: To what extent is it acceptable to exploit competence gaps in your own favor? The above categories can serve as a starting point for moral reasoning about activities in social media and may turn out to need further elaboration. There may be ethical challenges for organizational users of Facebook, Twitter, and other social media that the framework does not capture adequately. For now, it serves to zoom in on questions about right and wrong, permissible, obligatory, and forbidden in the use of social media in organizational settings. One final remark is that the distinction from the previous chapter between prescriptive and proscriptive ethics, or do-good-ethics and avoid-harm-ethics, is relevant even in the context of social media. As is the case with automation, ethical explorations in this field can easily become preoccupied with the proscriptive dimension and on the harm and suffering that can result from improper use of social media. Trolling, harassment, and the spreading of fake news give cause for concern, but it is also worth noting that social media provide platforms for constructive conversation and collaboration. People who would otherwise remain strangers to each other are able to communicate and exchange ideas. Individuals can move out of isolation and participate in social activities. This prescriptive dimension is an integral part of the ethics of social media.